These stories transport the reader from the mundane and commonplace, beckoning him to participate in a miraculous journey to a transcendental realm beyond space and time, a realm where everything and everyone lives in the blissful light of the Supreme Absolute, an eternal transcendental youth--Lord Sri Krishna, the ultimate object of knowledge and the supreme goal of life. In this summary study, Srila Prabhupada gives a complete translation and provides occasional commentary on Srila Rupa Goswami's classic, Bhakti Rasamrta Sindhu. We rebel at modern science's contention that we can be analyzed into lifeless laws and particles.We feel that personality is the solid foundation and unifying principle of our existence. That intuition is correct, says the Vedic philosophy of ancient India, which loudly proclaims the primacy of personality in every sphere of life and knowledge. And the essential Vedic teachings on the universal nature of personality are summarized in Sri Isopanisad, the foremost of the 108 Upanisads. According to Vedic tradition, these "Hymns of Brahma" were recited or sung countless millennia ago by the first embodied being, Lord Brahma, just before he created the universe. The book consists of a brief description of Brahma's enlightenment by Lord Sri Krsna, the Supreme Personality of Godhead, followed by Brahma's extraordinarily beautiful prayers elucidating the content of his revelation. His Divine Grace's summary in prose, of Srila Krsnadas Kaviraja Goswami's Sri Caitanya-caritamrta. What Krsna Book is to the Tenth Canto of Srimad Bhagavatam, The Teachings of Lord Chaitanya is to the Sri Caitanya-caritamrta. TLC was originally printed in l968, and later, in 1974 the Sri Caitanya-caritamrta was printed in l7 volumes with complete bengali verses and purports. Queen Kunti teaches us how to accept suffering as the Lord's mercy. Having led a life filled with many misfortunes Srimati Kuntidevi always depended upon the mercy of Lord Krishna. This book is based on Srila Prabhupada's lectures, verses, and purports from the first canto. Across five centuries and half the globe comes this compact guidebook of essential spiritual teachings. How to choose a guru, how to practice yoga, even where to live. You'll find it all in this invaluable work originally written in Sanskrit by Srila Rupa Gosvami, the greatest spiritual genius of medieval India. Now translated and explained by Srila Prabhupada, the Nectar of Instruction is the key to enlightenment for all seekers on the path of spiritual perfection. Within the interviews, lectures, essays, and letters of this book Srila Prabhupada talks about practicing yoga in the modern age. Topics include karma and reincarnation, superconsciousness, how to choose a guru, Krishna and Christ, and spiritual solutions to today's social and economic problems. ". . . I began translating Srimad-Bhagavatam in 1960; and, perhaps in 1961, I was your guest in the Gita Bagicha. You were very kind to help me partially for publishing my first volume of Srimad-Bhagavatam through the Dalmia Charitable Trust. 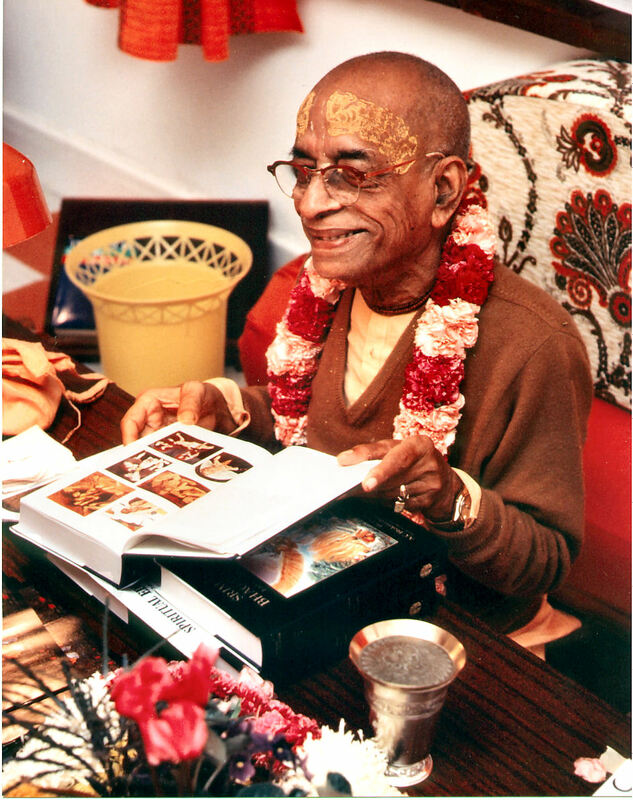 With great difficulty, I then published the second and third volumes of Srimad-Bhagavatam until 1965, when I prepared myself to come to this country with some books" ---excerpted from a letter written 2-05-70 in Los Angeles by His Divine Grace Srila A.C. Bhaktivedanta Swami Prabhupada to Hanuman Prasad Poddar. Sri Caitanya-caritamrta was written by Krishnadasa Kaviraja Goswami. This book contains the unabridged original Bengali text, Roman transliterations, synonyms, translation and elaborate purports by His Divine Grace A. C. Bhaktivedanta Swami Prabhupada. This is the definitive history and biography of Sri Krishna Caitanya. Here is a description of Sri Caitanya's life and teachings. Sri Caitanya pioneered a great social and spiritual movement in India over five hundred years ago, which today continues to spread its profound influence worldwide. While man in the West was exploring outward in the physical universe, in India Sri Krishna Caitanya was exploring inward, exhibiting unparalleled spiritual potency, and discovering the truths of consciousness and transcendental reality. As a young boy he overwhelmed astounded scholars, establishing his own school at the age of sixteen. Within his lifetime, Sri Caitanya transformed India in four respects: philosophically, by defeating the greatest philosophers of his day; socially, by opposing the blindly rigid caste system; politically, by organizing India's first civil disobedience movement against repression by the Mohammedan government; and spiritually, by freely distributing nonsectarian love of God. Sri Caitanya-caritamrta presents Sri Caitanya as the Golden Avatar, the incarnation of Krishna in this age in the form of His devotee. The amazing narrative of Ajamila's transforming near-death experience is chronicled in Srimad-Bhagavatam. In this book based on that narrative, Srila Prabhupada shows us how we can employ the techniques of mantra meditation and bhakti-yoga to overcome the obstacles of materialism, meet the challenge of death, and ultimately attain spiritual perfection. Beyond Birth and Death provides startling evidence of the soul's incredible journey after death. This book is a great way to understand the secrets of the soul and the science of reincarnation. Is there life after death? Srila Prabhupada tells how the soul travels from body to body, and how we can end the cycle of birth and death by reaching Lord Sri Krishna's ultimate abode. An excerpt: "The simple process of chanting the names of Krsna will reveal what one is, what God is, what the material and spiritual universes are, why we are conditioned, how we can get out of that conditioning - and everything else, step by step." In this small book Srila Prabhupada addresses the fallacies of our modern so-called advanced civilization. After pointing out that today the vast majority of people do not know what real progress is, he explains that in the Vedic civilization people strive not for the false progress of economic development but rather for the true advancement of self-realization and God realization. Again the topmost yogi of the modern age, Srila Prabhupada, expounds on the supreme yoga, Krsna consciousness. A sample: "Chanting the Hare Krsna mantra is not merely the process of putting an end to the false conception of the self, but it goes beyond that, to the point where the pure spirit soul engages in his eternal, blissful, all-knowing activities in the loving service of God. This is the height of conscious development." This book is based on taped morning-walk conversations that Srila Prabhupada had with some of his disciples during 1973, in the Los Angeles area. On those mornings when he focused on science, Srila Prabhupada spoke mainly with his disciple Thoudam D. Singh, Ph.D. An organic chemist, Dr. Singh presently directs the Bhaktivedanta Institute, an international center for advanced study and research in science, philosophy and theology. The simplicity, beauty and intricacies found in nature have captured the minds and hearts of the greatest philosophers throughout time. Even the greatest scientific minds of our time are at a loss to understand nature's greatest mysteries. Light of the Bhagavata presents a clear and tangible illustration of the purpose and significance of nature and it's origin. The Prayers of King Kulasekhara. The saintly king Kulasekhara lived more than a millennium ago in India, yet his Mukunda-mala- stotra speaks to us today with the fresh voice of truth. It is the voice of a realized soul beseeching the Lord - and us - with the utmost sincerity. He calls to all people to hear of the treatment for the disease of birth and death. Written shortly after World War II, this book describes how society can live peacefully in a state of God-centered communism. Every one of us is searching after happiness, but we do not know what real happiness is. We see so much advertised about happiness, but practically speaking we see so few happy people. This is because so few people know that the platform of real happiness is beyond temporary things. It is this real happiness that is described in Bhagavad-gita by Lord Krishna to Arjuna. In 1972, Bob Cohen, a science teacher in the Peace Corps, began a search for spiritual enlightenment that took him the length and breadth of India. Here is an actual transcript of his life-transforming meeting with Srila Prabhupada in the holy village of Mayapur, India, the birthplace of Sri Krsna Caitanya. Krsna Consciousness is the King of Education. Lord Kapila (an incarnation of Lord Krishna) explains the science of Sankhya yoga to His mother Devahuti. This wonderful book is a combination of lectures from Srila Prabhupada and excerpts from the Third Canto which contains the teachings of Lord Kapila. In these thirty-one fascinating essays, talks, and informal conversations, Srila Prabhupada reveals how the Vedic literature and the techniques of mantra meditation it teaches can help us resolve all personal and social conflicts, come to a state of permanent peace and happiness, and satisfy the soul's timeless thirst for perfection. All the selections originally appeared in Back to Godhead, the magazine Srila Prabhupada founded in India in 1944. This book explains the infallible law of karma, whereby everyone reaps what they sow. Krishna taught the Perfection of Yoga to Arjuna on the battlefield as he spoke the Bhagavad Gita. In the Perfection of Yoga the secrets of practicing this powerful system of yoga in today's busy world is described. Perfection of Yoga is a great introduction to the Bhagavad Gita and a short cut to the secrets of yoga. In the Perfection of Yoga Srila Prabhupada cuts through the commercialism that now clouds the real meaning of yoga. He explains that beyond postures and exercises, beyond even meditation and breathing techniques, the ancient teachings of yoga aim at lasting, loving union with the Supreme Personality of Godhead, Lord Sri Krishna. Srila Prabhupada explains the value of devotional service to the Supreme Personality of Godhead. Srila Prabhupada started Back to Godhead to fulfill the mission of his spiritual master, Srila Bhaktisiddhanta Sarasvati, who had ordered him to preach Vaishnavism, the science of Krishna consciousness, in the English-speaking world.